Cooking rotisserie chicken has become our specialty, here at Benny’s Tacos. 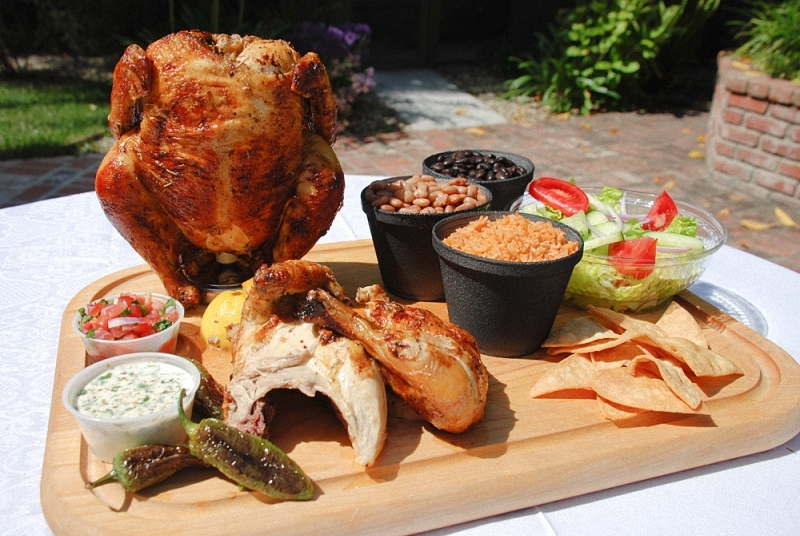 The menu from Benny’s Tacos in Santa Monica and on Manchester is full of delectable Mexican entrees like quesadillas, burritos, tacos, and fajitas, but the chicken is roasted to perfection daily, deliciously marinated and seasoned with garlic and herbs. A rather spectacular dish on the menu. Chicken always hits the right spot, whether on a lazy afternoon or during a busy evening. Although, this has gotten us curious about the journey that cooking rotisserie chicken in the past has taken? Let’s see if we can dig a little deeper. Although cooking rotisserie chicken gained its massive popularity in the 2000s from sales in supermarkets and Costco; the bird and the method of rotisserie has come a long way from another country. Originally Rotisserie Chicken appeared in France during the Medieval period. Grilled chicken was a favorite for King Richard the Lionheart during the 12th century. At this time it was made as a stew. The appeal of rotisserie chicken is the roasting of the meat using spit skewers. The “spit” is a metal rod that went through the whole chicken, which then would be rotated and cooked slowly over a heat source. Rotation of the meat allowed it to be cooked evenly, within rows by the heat radiation. There were records that the first rotisserie was turned by dogs, then it went onto steam, then clockwork. It is in 1946 when Rotisserie Chicken is introduced in Mexico. It was first founded on the street corner Gutenberg Melchor Ocampo in Colonia Anzures. The first rotisserie cooked was called the “Chicken Rio”. The people had then developed its own spin to the seasoning of the chicken: using garlic, curry, beer, lemon, barbecue, and more. It also eventually became a favorite dish in the family household in 20th century Mexico. By the 70s, Mexico was filled with rotisseries. Rotisserie chicken is, indeed, our specialty at Benny’s Tacos. With it, we serve a wide arrange of options including a half, a whole, and 2 whole chicken for your delight. It is also available in our catering and family style options. Our dishes are also served with a complete package of rice, beans, salad, tortillas, garlic paste, and guacamole! For a meat that is soft and tender, you won’t find rotisserie chicken that basted so lovingly like ours in the West LA community. Visit our locations in Santa Monica and Westchester to get a taste of how cooking rotisserie chicken and serving it with classic Mexican entrees will have you leaving with a smile. Yes, al pastor comes from Mexico. But the idea of spit roasted pork doused in a sweet chili marinade didn’t come from Mexico. It came from Lebanese immigrants, and originated from the dish known as schwarma. Even then, however, to dive down this rabbit hole a little further, schwarma originates from the Ottoman Empire, and not just schwarma, but a few spit fire meats. Ali Qleibo, a Palestinian anthropologist says, “Turks call it doner kebab, Greeks call it gyro, Iraqis call it kas.” All of these cultures, including the original al pastor taco makers (“taqueros”) in Mexico, are serving and eating extensions of a cuisine that dates back to when Saladin and Richard I were fighting the Crusades. As Lebanese people immigrated to Mexico, by the 1960s a mix of their homeland fare and Mexican tacos led to the al pastor advent. Instead of upward standing schwarma rotisserie, they used a horizontal spit roast, traded lamb for pork, and used Mexican flavored spices and marinade. Alex Stupak, a chef that went to Mexico City and ate 40 different al pastor tacos in three days gave the following notes: first and foremost, the pineapples that sit atop the roasting pork do nothing for marinating. It’s excellent in the taco, but “pure myth” that it does anything for the flavor while it’s cooking. Second, using both rojo and verde salsa is key to the epitome al pastor. Lastly, a nice crisp char on the outside for some enhanced texture and of course, topped with onion and cilantro. At Benny’s Tacos, our al pastor, alongside the rest of our tacos, satisfy our patrons on an hourly basis. With only the freshest, highest quality ingredients and highly experienced cooking staff, our tacos will make a regular out of you. Come in for West Los Angeles’s best taco spot.